About every December 7th I begin thinking of my old Navy days. Not that I was in the Navy that fateful day of Pearl Harbor in 1941 because I was only year old at the time. But I joined the Navy later and we often talked of that “day of infamy” and chronicled it again in the ship’s newspaper. Twenty years after Pearl I was aboard the aircraft carrier, ANTIETAM (CVS-36). Things were relatively tame on the “Flying ‘A’” until President Kennedy and Nikita Khrushchev put the cards on the table over Cuba. Although we were supposedly only a training carrier in the Gulf of Mexico we loaded to the gills with food and fuel and struck out for Cuba on that anxious days in October of 1962. Forty years ago! How time flies. I never knew anyone else had served on the Antietam from Telfair County but I was talking-to my friend Guy Fussell one day at a funeral at Blockhouse Church and he told me he also served on he ship. And I knew we had many men from Telfair who had served on various ships in the Navy but I never knew a ship was named “Telfair. How a ship came to be named for a small county in this part of the state is unknown to me. But I can’t help wondering if Governor Eugene Talmadge of Telfair County had something to do with it. His term ended in 1943 and Governor Ellis Arnall took over in 1944 and the keel of the ship was laid that same year. Usually, if Gov. Talmadge got involved in something, like university system politics, for instance, you heard about it. But I never heard about his influencing the naming of any naval vessels. But he might have. 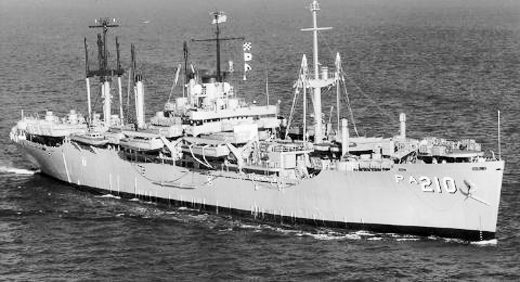 The little ship seemed to maintain a status of prominence, even back in the fifties: “The USS Telfair was the first US Navy ship to commence one of the greatest humanitarian operations undertaken by the US Navy. It was called the “Passage to Freedom”. The TEFAIR helped Vietnam refugees and others escape that war-torn land. Other ships would follow but TELFAIR was the first in that effort. The valiant little ship TELFAIR earned one battle star for World War I and three battle stars during the Korean War. Classified as an Attack Transport Ship, her ship’s number was APA-210, later LPA-210. Her length was 455 feet. She was 62 feet at the beam (across), her draft was 24 feet and her speed was 17.7 knots. She had a crew complement of 532 and a troop capacity of 1,562. But even the TELFAIR’s days were eventually numbered. Her crew in her later years affectionately called her the “Tremblin T” because of a shaft vibration at high speeds. They had a funeral (decommissioning) for the Telfair in 1958 but resurrected her in 1961 for more service. They finally put her to sleep for scrap in 1968. “During World War II and the Korean conflict, TELFAIR won the following awards and ribbons. She was sold for scrap iron in 1968, her final funeral, but her spirit lives on and she does proud the county she is named for. When the boys of Jacksonville and Milan and China Hill and Workmore and McRae and Helena and Lumber City and Towns and Scotland and other communities in the county sit around and talk about their old Navy days they can now included in their memory banks the fine contributions of TELFAIR, the little ship that established one of the finest records in the U.S. Naval History. Credits: “Salute to USS TELFAIR, APA-210/LPA-210”; Marion Hazzard for his info on the ship in the movies; info provided by other crew members of TELFAIR; other sources.